Mobile devices are set to revolutionize operations within the restaurant industry; there is no doubt about this. It may still seem hard to believe but, with the way mobile devices are going, the sky is the limit and this is a great fit for hospitality. When used correctly, these devices can transform the way your restaurant is run. Using handheld POS can increase the overall performance and streamline the efficiencies which will improve profits. Waitrons no long need to run to a station to capture an order; they can capture the order at tableside and use this as a valuable opportunity to upsell or cross-sell. You can streamline the operation further and keep customers happy by having dedicated waitrons taking orders (the number of waitrons assigned to this task will depend on the size of your establishment) while the rest of the waitrons will deliver the food and drink orders. Imagine how much better your staff could perform if they had all of the resources of a POS system at their fingertips while helping guests. Customers will be happier with orders arriving promptly which will also help improve the customer’s overall experience of your restaurant. Take advantage of upselling and cross-selling opportunities with mobile POS – this is a great avenue for moving the more expensive inventory items, increase turnover and boost your revenue. Mobile POS also presents the opportunity to make sales in outside areas such as patios, tents, catered events and so on. 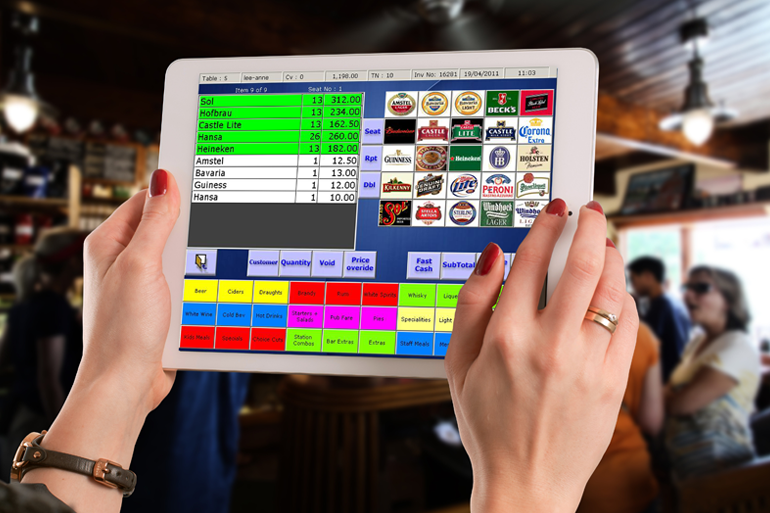 Most modern POS systems have built-in reporting features to help owners and managers determine when their busiest times are and what their best selling items are – take advantage of this data and use it to create upselling and cross-selling opportunities. Mobile POS has been designed to make business simpler and allow restaurant owners/managers to focus on delivering an outstanding service alongside an excellent product in a clean and friendly environment. Mobile applications have become more prevalent thanks to the evolution of technology – this evolution has also seen improved security and reliability in mobile devices and applications. A number of top restaurants are already using mobile POS in conjunction with their stationary POS system which allows them to streamline service and maximize opportunities. Some restaurants will benefit from a combination of stationary POS terminals and mobile POS terminals, and others will find better success with one solution or the other as opposed to a combination of the two – don’t forget to discuss your specific needs with your POS supplier and they will recommend the best setup for you.